JUNONA Kitchen Set of 7 Units. White High Gloss and Grey Wolfram Doors / White Carcasses. BRAND NEW AND FLAT PACKED. 7 Units set as per sketch. Plinths, handles and fixings are all included. Total length of all units is 240cm. This will fit in a Ford Focus type of car or larger. You will not be disappointed. 2 pieces (40 and 60cm lengths) of 32mm thick worktop are included in the price. Base units stand on the side panels and have no legs. Appliances and sink are not included in the set. Height wall unit: 57.3 cm. 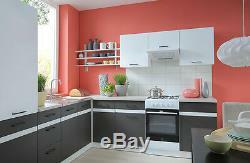 Height base unit with worktop: 85.2 cm. Height base unit without worktop: 82cm. Depth wall unit: 30.5 cm. Depth base unit without worktop: 47 cm. 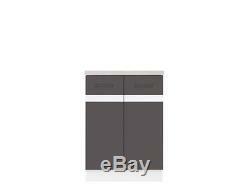 Depth base unit with worktop: 60 cm. Packed flat for home assembly. NOTE: The total height of kitchen depends on how high wall units are positioned on the wall. 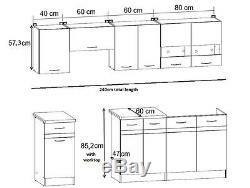 1 x Wall unit with one solid door 40cm wide x 57.3cm high x 28.8cm deep. 1 x Wall unit with one solid door to go above extractor fan 60cm wide x 30cm high x 28.8cm deep. 1 x Wall unit with two glass doors 80cm wide x 57.3cm high x 28.8cm deep. Please note unit comes with solid shelf. 1 x Wall unit with two solid doors 60cm wide x 57.3cm high x 28.8cm deep. 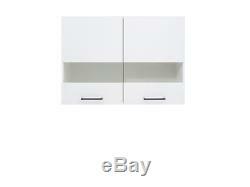 1 x Base unit with one solid door and one drawer 40cm wide x 82cm high x 45.3cm deep. Included is a piece of worktop to go on top of the unit. Worktop is 40cm wide x 60cm deep 3.2cm high. 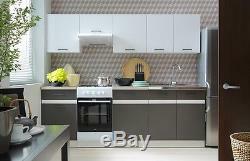 Total height of the unit with worktop is 85.2cm. Total depth of unit with worktop is 60cm. 1 x Base unit with two solid doors 60cm wide x 82cm high x 45.3cm deep. Worktop is 60cm wide x 60cm deep 3.2cm high. 1 x Base sink unit with two solid doors 80cm wide x 82cm high x 45.3cm deep. Sink can be placed on top of the unit and no worktop is required. Single leaver tap available at 25. Please note base units stand on the side panels and have no legs. This kitchen set is ideal to be used with a 60cm wide free-standing cooker. Total length of all units when put in a straight line is 240cm including a cooker 60cm space. 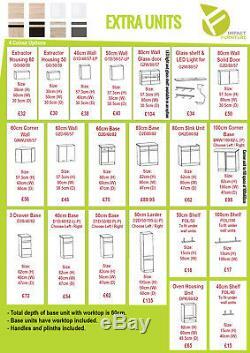 Units are free-standing and do not have to be placed in a straight line. Please see the photo gallery where the last photo with green background details all the available individual units and gives info on prices and sizes of the extra units. Please note goods are delivered on a pallet to the building door only. (KA 1-26, 29+) - 49.00. 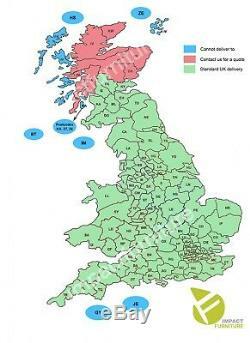 And BT postcodes - 79.00. PLEASE NOTE WE DO NOT DELIVER TO THE FOLLOWING POSTCODES: HS, IV41-51, IV 55-56, KA 27-28, KW 15-15, PA 20+, ZE. 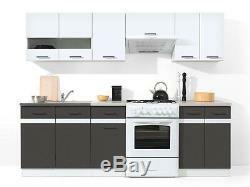 Brand New Complete JUNONA Kitchen Set 7 Units - White High Gloss / Grey Wolfram. Please note: The wall fixing raw plugs are for brick walls only and not suitable for other types of walls. We are unable to make deliveries to Northern Ireland, Isle of Man, Isle of Wight, Scottish Islands and Channel Islands due to high costs. Small to Medium Sized Items. Small to medium sized furniture pieces are delivered using Parcel Force or Tuffnells couriers. Unsuccessful deliveries will be reattempted the next day. Tuffnells can be seen once item is tracked on their website. Your local depot tel number can be obtained at Palletforce website /find-a-depot. Goods are delivered to the building door only and there will be no taking goods upstairs. Please ensure there is someone to offload and move boxes if they need to be moved. The goods will be left beside your premises at the safest convenient location. PLEASE NOTE carry items upstairs also covers flats which are not located on the ground floor. Drivers are unaccompanied; they will not move or take away any existing goods or property and will not carry out assembly or installation of the goods. 24 or 48 hr service used for small products such as TV units, shelving units, small sideboards. 48hrs service for larger items such as beds, large sideboards and tables. This is a palletised courier service used to dispatch furniture sets such as kitchen sets, living room sets and bedroom sets. Goods are delivered on pallets and to the building doors only, please ensure there is someone to offload and move boxes if they need to be moved. Return posting costs will be at your expense. Please check listing page carefully as most of the answers are usually there. The item "Complete Kitchen Set 7 Units Cabinets White High Gloss/Grey Wolfram Junona" is in sale since Friday, February 6, 2015. This item is in the category "Home, Furniture & DIY\Kitchen Plumbing & Fittings\Kitchen Units & Sets".